Keeping a senior loved one healthy and ensuring he or she is eating a well-balanced diet can be difficult when most seniors live on a tight budget. If you provide senior home care in Harrisburg, consider the following tips to make your senior loved one’s dollars go further when grocery shopping. 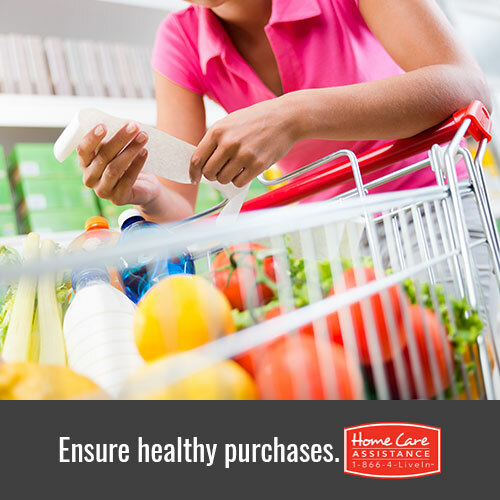 Check store circulars for sales and coupons and plan meals for your senior loved one using what’s on sale. Take advantage of the store loyalty programs to save money, and when you shop, don’t deviate from the list. Not only will you save money, it will help you come up with some creative menu options. Whole grains and legumes like quinoa, brown rice, and beans are high in protein and fiber and cheap—especially if you buy in bulk. Beans and rice are great at bulking up meals if you’re saving money by cooking less meat, or they can be a meal on their own. One great way to save money on fresh food is by buying fruits and veggies in season and freezing it. Most types of produce can be frozen and remain fresh for months, including corn, berries, peppers, and tomatoes. You can often find great deals on all sorts of fresh foods at your local farmers’ market. You can also go later in the day, the last hour or so before it closes, for steals on the produce vendors want to sell before packing up and leaving. Would you like to learn more about senior health and nutrition? Reach out to the senior care experts at Home Care Assistance. We provide professional, compassionate hourly and 24/7 live-in care in Harrisburg, and our caregivers can grocery shop, prepare healthy meals, and ensure your loved one’s dietary need are being met. Call a trusted Care Manager at (717) 540-4663 to learn more about how a caregiver can help your loved one maintain a happy, healthy lifestyle.